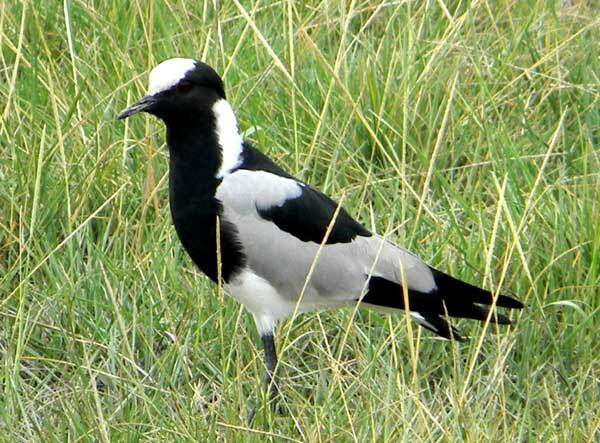 Observed on the plains of Amboseli parts of which are a seasonal lake. Kenya, March 2011. Some birds have plumage that is well camouflaged and allows them to hide from predators within their preferred habitat. Clearly the Blacksmith Plover does not employ this tactic as it sports its bold pattern of black and white. Some speculate that it is a warning to predators that it has a potent defense, namely a sharp spur on the leading edge of the wing. These birds hunt small insects mostly in open areas with little cover. Look for this common bird at lake shores and in wet pastures. Copyright Michael J. Plagens, Page created 27 July 2011.